#StPetersburgTourGuide. #PrivateTourGuide. #PetersburgGuide. #StPetersburgGuide. #TourGuideStPetersburg. #TourGuidePetersburg. #GermanSpeakingGuide. #GermanSpeakingGuideStPetersburg. #GermanGuide. #GermanGuideStPetersburg. #SaintPetersburgPrivateTour. Spanish speaking guide in St Petersburg Russia. Spanish speaking guide. Private guide in St Petersburg Russia. Guia de espanñ. 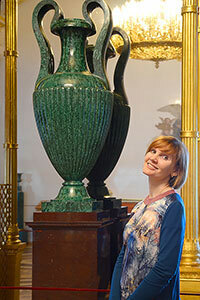 l. Private guide in St Petersburg Russia. Guia en españ. ol en San Petersburgo. Guia en San Petersburgo. Good day, my future friends! My name is Olga. According to my education I am a professional historian. While I was studying in the University, history for me consisted mainly of books in libraries or documents in archives. Everything changed after I graduated. I discovered the real world which offered me a lot of challenges. Work in a library or public school at that moment could not give me the feeling of financial independency so it forced me to look for an alternative and I discovered it – profession of being a guide. I entered a special school for English-speaking guides, then I went to our museums to get all necessary licenses. After numerous exams, I finished the studies with excellent marks and a lot of knowledge, and started working. It was then when I absolutely unexpectedly discovered my own meaning of history. Saint-Petersburg IS alive Russian history. Every stone in the historical centre speaks of it, every building breezes with the lives of its old owners. As a guide and a historian, I can "translate" the language of our city into the music of human souls. I love Saint-Petersburg and my job gives me chance to "infect" guests of our city with this love. I have been working as a guide since 2006 and now I understand that I am not a historian who writes books and discovers new documents in archives but a guide who helps to reveal the incredible heritage of Saint-Petesburg to the World. However, I am not a guide who teaches or gives lectures/ I am the one who gives you facts and then we together draw conclusions and make puzzle of Russian history and culture. I hope this technique stops me from being boring. Hope to see you in Saint-Petesburg and get a chance to discover it with you! Me llamo Olga trabajo de guía en San Petersburgo desde 2006. Tengo las licencias oficiales para trabajar de guía en todos museos principales de la ciudad. Estoy acreditada por el Gobierno de San Petersburgo para dar visitas guiadas en español, portugués y inglés. En la universidad estudiaba historia entonces según mi educación soy historiadora pero en vez de trabajar en los archivos con documentos históricos o bibliotecas con los libros descubrí que prefería estar fuera de los muros. Para mi San Petersburgo es verdadero paraíso donde cada piedra habla de nuestra historia y cultura. Entonces siendo el guía lo que hago es "traducir" la lengua de los edificios, las calles, las catedrales de San Petersburgo a la lengua de las almas de mis turistas. San Petersburgo es mi amor, mi pasión y mi destino. 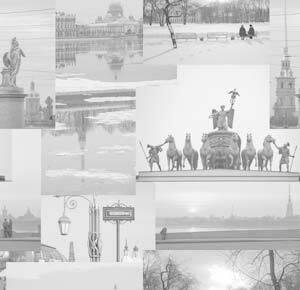 Desde 2006 ayudo a descubrir la magia de San Petersburgo a los visitantes de todo el mundo. Comparto con ellos no solo mis conocimientos pero también mi amor a esta ciudad. Durante las visitas guiadas intento hablar solo de los hechos objetivos de historia Rusa y después tiramos los conclusiones y hacemos el puzle del pasado ruso juntos (mis turistas y yo). Esta técnica espero que me ayude de no ser aburrida. ¡Nos vemos en San Petersburgo!